Well that's the second Biggar Spring Gaitherin' over. Crowds were pretty small although all that attended seem to enjoy themselves. A highlight of the workshops for me was when all the tutors got the classes together and performed a mini concert. Harris Playfair's Ensemble and Mairi Campbell's Scots Song combined to make a great piece of music. Another fine moment was when Harris introduced his ensemble piece Jeannie Ellen. Mairi's ears pricked up and it turned out to be her tune Jean Yelland. She had taught it to a group in Canada and they had forwarded the tune to Harris with a slightly different title. Both the concerts went well. Stars of the Friday lineup for me were Clare McLaughlin and Marianne Campbell (cMc). It was great to here them play again after a few years. They have real energy when they play and they really made the audience sit up. Saturday with The Cast and Shona Mooney Band was well balanced. The Cast were singing material from their long awaited third album out in August. I'm not sure what we'll do next year if anything. It probably will not be the same weekend. It shouldn't really matter as the event starts on a Friday night and the public don't have to get off work for that. I'll think about it. I nearly had a meeting today to discuss the 2008 Scots Trad Music Awards. Its looking like it will be at the Fruitmarket in Glasgow. This is a fantastic venue and will help realise any TV ambitions we have. Soon we should know if we've got the Arts Council of England traunch of funding towards our Distil project. It's been a while but it will enable us to continue with the English side of project. The Scotland side is well under way with the Showcase Concert on the 26th October in Stirling and the residential course in April. Just to finish up I'm watching Newsnight on BBC 2 and all the runners for deputy prime ministers are campaigning and answering questions on the issues of the day. I was annoyed the other day whilst reading Private Eye that the candidates are receiving sponsorship from commercial companies to help fund their campaignes. I think this is terrible and part of the way down the line to the USA system. I think this should all be funded by the public purse and commercial companies and their interests should not be part of an election. Biggar Spring Gaitherin started tonight and I'm just back from hearing Emily Smith at Clydesdale Folk Club. It was a great night. Emily (and husband Jamie) work very hard on the scene and sometimes I think they don't get the attention they deserve. She sang many songs tonight in both Scots and English and she is not afraid to pen her own numbers which fit right into the tradition. Their music works very well as a duo an there's lots of good patter as well. Well done to Clydesdale Folk Club to consistently booking talented artists. Next up is the concerts on Friday and Saturday night. I'm feeling nervous about the classes on Saturday daytime and I'm hoping a few more people turn up! I had a meeting today in Glasgow to discuss more the possibilities of the Scots Trad Music Awards on TV in 2007. It was good to talk to guys with experience in this field and whether or not it happens this year it will make us look slightly differently at the composition of the 2008 event. When I left the meeting I went and ordered two passports for my kids – £45 each and they only last for 5 years – someone's making money. I then went into Virgin and bought 'Thrust' by Herbie Hancock and a Keith Jarrett CD both at £5. I also bought a book about Billie Holiday for 99p – a bargain in anyone's currency. It must be hard being a high street music shop at the moment trying to compete with all the online stores (which I mainly use) but I'm glad I went in. I was also contemplating buying some 'electric' Miles Davis but I wasn't sure what to buy. Yesterday's meeting with the Scottish Arts Council was positive but we now need to state our case in financial terms which we'll hopefully do. Finally our new Foot Stompin' budget CD Proud to be Scottish arrived at the office yesterday. It's full of exciting Scottish traditional music from the Foot Stompin' label including Stuart Cassells, Shona Mooney, Jenna Reid, Back of the Moon and many more all for the cheap price of £5.99. We've been chatting this week about the layout of the Scots Trad Music Awards. It looking good. We've been talking about the nominating process and how to make it better. We're also about to reach a decision on the Scottish Traditional Music Hall of Fame. We should be able to announce the names within the month. The Thursday night show (November 29th) now looks like it will be the Peatbog Faeries (after their stunning opening to the show last year). We want this to be a dance-a-thon and are looking for a DJ as well. The St Andrew's Friday night Ceilidh will consist of the Marian Anderson Scottish Dance Band and a ceilidh band which will exhibit the 3 styles of Scottish dance. The Biggar Spring Gaitherin is fast approaching. it starts on Friday 26th with a concert in Biggar Corn Exchange (7.30pm). It will feature myself, Clare McLaughlin, Marianne Campbell, Harris Playfair and Jack Henderson. I always enjoy the intimate atmosphere of the venue. More info at http://www.handsupfortrad.co.uk. Tomorrow I have a meeting with the Scottish Arts Council to talk about future funding of Hands Up for Trad. Fingers crossed! Finally sad news has reached me of the passing of Shetland guitar legend Peerie Willie Johnson. I met him a few times and always found him great fun and a real character. Whenever I met him he would rather be playing the drums! You can read about his life here http://www.tradmusichall.com/PeerieWJohnson.htm and read tributes to him at Foot Stompin. The gig was great in the end and I really enjoyed playing with Kevin MacKenzie who stould in for Dave Milligan at the last moment. We covered a lot of material that we originally performed with the Simon Thoumire Three in the early to mid ninties and hadn't played since. We updated it by featuring more improvisation than usual and we went on a few flights of fancy. There is a CD of the gig and I hope to upload some cuts from it in the near future. The bug bear of the whole trip was flying with RyanAir. They charge for everything. You can't even put a bag in the hold without paying a fiver. 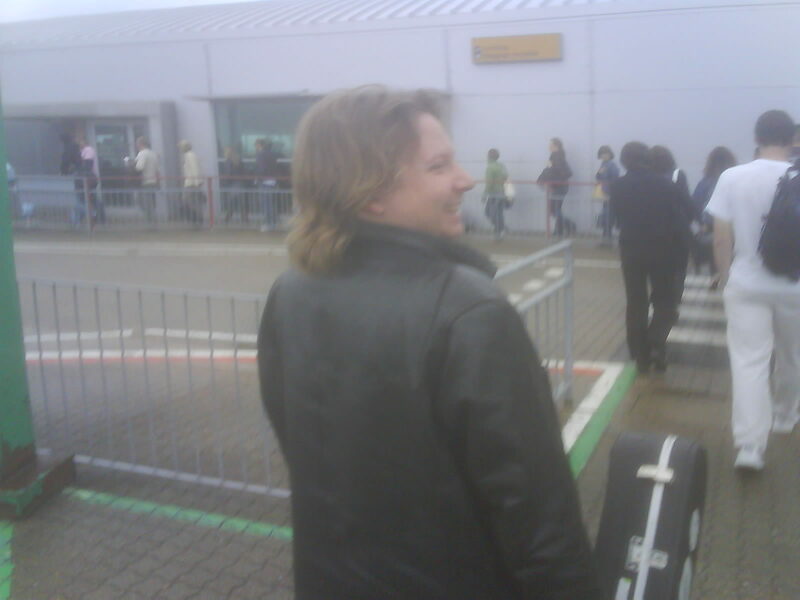 They now don't recognise an instrument as baggage either so Kevin had to pay £20 per flight to travel with his guitar. Due to inconsistency we luckily didn't have to pay this everytime but if we had – and because RyanAir don't do baggage transfers – it would have cost us an extra £80 (4 flights). This is sheer robbery (IMO) and I for one will be advising people not to fly with them. Why don't they give us the real cost of flights? They seem to be more concerned about disguising the true fares. I'm sure they would gather more respect by being open and advertising the true flight cost. We ended up spending 7 hours in London Stanstead twiddling our thumbs (not RyanAir's fault!) and when we finally got through to the flight lounge (backstage!) we were wondering around all the 'duty free' shops when we come accross the 'British' shop. 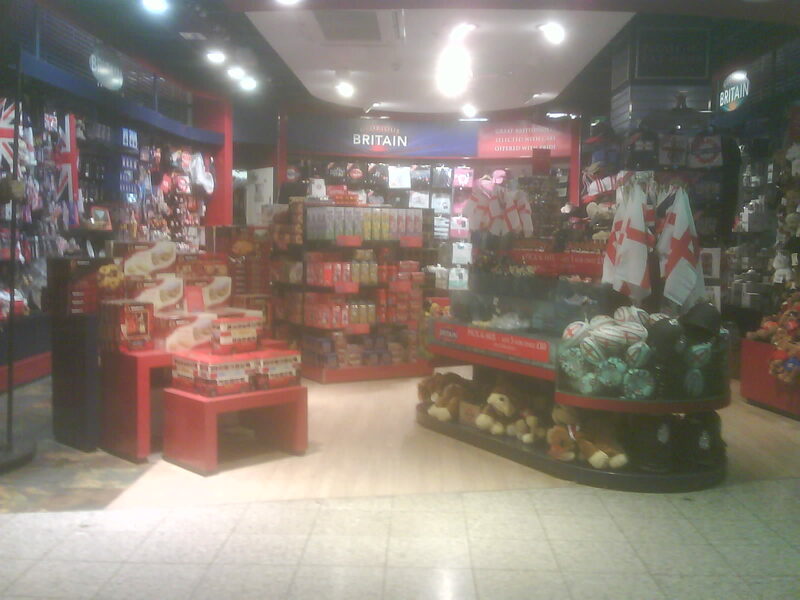 I have no problem with this shop although if they want to represent Britain please do it properly. The place was full of British and English flags – not a Saltire or Welsh Dragon to be seen anywhere. I did eventually find some Scottish shortbread although I don't think it was representing Scotland. This was giving the completely wrong impression of Britain and missing out on some beautiful culture that the other countries in the union have. Here's a picture of the shop. Gordon Brown MP would have liked this place. Just uploaded Christine Kydd's Ayepod course today. It has taken a while but it has been well worth it. Christine sings very well and I particularly enjoyed the way she taught the Scots language within the songs. I had to find out a new way of working out payment and paypal has come in handy as the cart. In the next few weeks I'll update all the teaching courses to use paypal as it is much better than what we've got at the moment. You can check it out here. Also on Ayepod I've updated the discussions podcast a few times. There are now 9 musicians on it with Finlay MacDonald recorded and ready to go. You can subscribe to the feeds by going to http://www.ayepod.net/podcasts/podcasts.htm and choosing the feed you would like. Over the rainy weekend I watched the Eurovision Song Contest. I thought it was an interesting switch from last year to see more of the countries going back to using their own language rather than English (or maybe American). It was all pretty dreadful with the UK entry being one of the worst. I dont think Gordon Brown will like this but I was hoping it would be last. I liked the Irish entry – which did come last – as it at least featured traditional musicians (Dervish) keeping an eye to their indigenous culture. It was very amusing to watch all the eastern European countries voting for their pals and neighbours that they're not meant to like very much. I haven't moved much further on the Trad Music Awards apart from we're in talks with the Inverness Gaelic Choir to lead the finale of the event singing Canan Nan Gaidheal and the Freedom Come All Ye. I also booked the 50 tables for the event today. We're trying to sit all the nominees at tables this year and give the raked seating over to the public. Finally I'm heading to Udinese in Italy tomorrow with guitarist Kevin MacKenzie for a quick gig and then back the next day. Seemingly it's a fantastic wine region so I'm taking a large bag. I'll report back on this the next time. Keeping quite busy here. I'm just finishing off Christine Kydd's Ayepod Scots Song teaching course. You can hear Christine sing and get an idea how the course will look by visiting YouTube (http://www.youtube.com/watch?v=AVOIyBkLpF4). You can check out all our videos by visiting here http://www.youtube.com/footstompin1. Also we need to gt more people to enrol for the teachng in the Biggar Spring Gaitherin. The Gaitherin is happening again on the 25th, 26th May. We've a concert in the Corn Exchange in Biggar on the Friday night with myself, Clare McLaughlin, Marinanne Campbell, Harris Playfair and a surprise guest. Tickets are £8 (£6 conc) and the concert starts at 19.30pm. Tickets are available on the night or from Hamilton Town House 01698 452299. In the evening Shona Mooney and her band will be performing at the Municipal Hall in Biggar. For this concert they will be joined by folk favourites The Cast featuring Mairi Campbell and David Francis. This starts at 7.30pm and costs £8 (£6 conc). Tickets are available on the night or from Hamilton Town House 01698 452299. Matthew Fitt (Itchy Coo) and I also just entered a couple of songs in Dumfries and Galloway Arts Association Burnsong competition. We entered 'Icker in a Thrave' and 'Ken Yir Hert', two songs in the Scots Language. You can hear 'Icker in a Thrave' here. Burnsong is a national project dedicated to promoting, encouraging and nurturing songwriting in Scotland. Burnsong events include songwriting workshops for schools, professional development courses for writers as well as live music events in Dumfries and across Scotland and a national songwriting competition. Finally I'll be out and about tomorrow delivering BBC Radio Scotland Young Traditional Musician Award 2008 flyers. If anyone wants to enter the award visit the Hands Up for Trad website. It's been a big week in Scottish politics. The General Election was held on Thursday which I found very exciting. We decided to have an election night party and invited fowk over that night at 10.30pm. They left at 3.30 and there was only 8 seats declared. None of us could believe the amount of ballets that were returned - 1700 in one case – surely someone was losing out somewhere. I suspect it was the little parties who were all pretty trounced in the end. Whatever your political persuation the result was pretty momentus with the SNP ending Labours dominance for the last 50 years. We'll see who comes up with the best coalition in the next few days. I haven't made many advancements in work these last few days but I have managed to dig a pile of weeds and clear old earth into a skip. I'll get back to it all on Tuesday (bank holiday tomorrow). Tasks to be done are to sort out the Distil Scotland Showcase in October (Stirling), rethink the Hands Up for Trad St Andrew's Celebration and get back to writing the bagpipe concerto. One thing I have managed to do is to get the Ayepod podcasts (http://www.ayepod.net/podcasts/podcasts.htm) up on itunes. It took me a while to work out how to get the xml files right with the right keywords etc so they can be found with someone looks for Scottish music. Check them out.